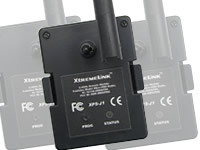 The connection between the X10+ and receiver is made using a single cable connection. We offer several lengths of our UltraTwist cables which offer the easiest routing and highest immunity to RFI/EMI. We successfully tested over 60 feet of cable between the X10+ and a receiver, and for fun we tested a 1000' spool of telephone cable and that worked perfectly! The X10+ is called "+" because it can output up to 10 channels, and with the auxiliary port set to an output, an 11th channel is available. The auxiliary port can also be an input for a 2nd receiver for true RF redundancy! The X10+ has a heavy duty (up to 10awg wire) power inputs, allowing you to power the servo bus properly! As part of our testing, we made the servo bus into a 'fuse' between power connections and pulled 80A@12v with no over heating of the servo bus. So, it is more than sufficient for powering servos! You can power the X10+ using the normal servo ports, like a traditional receiver too. Keep in the mind that the power going into the X10+ is the power also coming out of it. So, if you plan to power your setup using a 2S Lipo, MAKE SURE that your receiver and servos can handle a 2S Lipo setup! There is NO voltage regulator for the receiver (with exception of the special Spektrum jumper mod to provide 3.3v to the satellite receiver, more on that below). The X10+ has our popular TattleTale built-in (a $19.95 value!) The lowest voltage captured is shown as a color, and uses the exact same color/voltage as the Tattletale. So, if your LED turns yellow it means the input voltage dropped below 4.5v for at least one frame period in time (11ms-22ms, depending on the radio system connected). This device does NOT lie... so don't ignore a color change - you most definitely have a problem when the LED is not solid green! Our normal reboot warning is available when using a RFU, Nano, or Nano II receiver. So, if the LED is flashing slowly, it means that the receiver lost complete power and rebooted. It's not possible to have the warning with other protocols as they don't pass this information in the serial data stream. The X10+ servo outputs are nearly simultaneous, with just 71 microseconds maximum time between servo outputs! This means that customers using non-XPS receivers will for the first time ever have servo outputs that occur at virtually the exact same time. This make a huge difference in swash plate manipulations, split elevators, etc. Just like all XPS receivers, every channel output can be mapped for any receiver channel. So, you can swap outputs to make installations more convenient. ie, using the two outer servo channels for left and right aileron connections. You can also do things like have three rudder channels and set the offset between them, or even reverse servos. The X10+ has a failsafe override (on by default). This means that it will ignore the failsafe of the receiver and use it's own failsafe settings. If you don't have failsafe override enabled, then the receiver will provide the failsafe control (which is of little with systems that only have a throttle failsafe). With the failsafe override enabled, like every XPS receiver, you can independently set the failsafe for every single channel. There are three different failsafe types you can choose from: hold last position, user defined position, or signal off (handy for auto pilots that use a loss of servo pulse to trigger a return to home function). Every channel can have a different preset position, and it is done with our live active failsafe. This is accomplished by pressing the button on the X10+ for 2 seconds, at which point you now have 7 seconds to move the controls to where you want them to be during a failsafe condition. Once the failsafe positions are 'locked' into memory, any channel that has had its failsafe type defined as 'user defined' will now go to that position when a failsafe occurs! This is nothing new for XtremeLink customers, but for the first time JR, Futaba, and Spektrum customers can see what they have been missing! 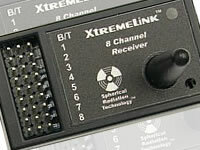 Spektrum satellite receivers can be powered directly by the X10+ when using a special solder bridge jumper. This provides 3.3v to the receiver (instead of the normal servo voltage). This means you don't need the adapter cable commonly used with Spektrum satellite receivers to convert 5v to 3.3v. A 2nd satellite receiver in the AUX port requires a power adapter (which we sell). These boards are conformal coated to make them water resistant. Keep in mind that you can use as many X10+ boards as you like in the SAME system! You just use Y-cable(s) to connect the serial data connection from the receiver to each X10+ setup. 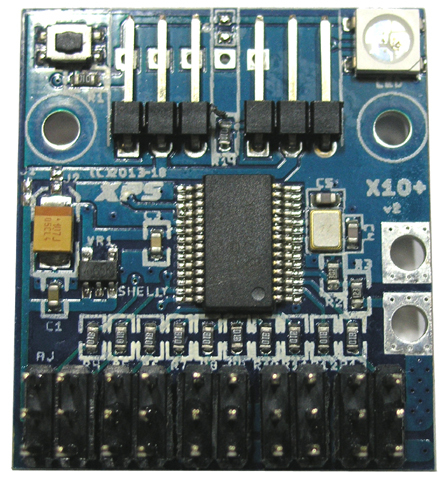 The X10+ operates down to 1.8 volts! This is well below the operational voltage of ANY servo and ANY other brand of receiver (except ours of course!) So, the X10+ stays fully operational in the lowest voltage conditions. The X10+ enabled me to place the receiver aft and up on the tail of a sailplane equipped for FPV flying. It also supports the higher power requirements in large planes like my Four Star 120.